Trying to lose weight? It may be as simple as having two protein shakes per day. Unlike most fad diets that are out there, you won’t starve yourself while trying to lose weight. Having two shakes a day will help you maintain the muscle you will inventively gain while exercising and you won’t spend a ton of money on those fancy pre-made food plans that are so popular these days. 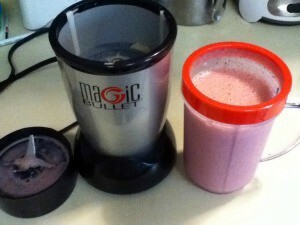 The best part of it all is that the shakes taste great and are a great addition to your weight loss plan. Did I mention that you will get healthier in the process? Two high protein low carb shakes per day. The shake includes protein powder, a banana, flax seed and soy milk. In addition to this, I have 3 other small meals per day. I have reduced my calorie intake by approximately 400 calories per day. You can easily do this by eliminating that can of pop, bag of chips and random sugary snack we all like to have. This is a very livable change to your daily diet and you won’t starve in the process. Exercise three times a week and you will see the pounds begin to drop. The foundation of my protein shake is the protein powder. I add approximately 20 grams of protein to each shake. I’ve tried whey protein powder and soy protein powder. But which one should you chose? Whey protein powder is said to be the best source of protein, followed close behind by soy protein powder. I have used whey protein in the past and it gave me good gains in muscle growth but I have a couple of problems with whey protein powder. Whey protein is an animal product and I am trying to eliminate animal products from my diet. The second problem is that it gives me excessive amounts of gas and I always seem to feel bloated when I use it. Switching to soy protein powder solved all the problems I had with whey protein powder. I no longer have gas or feel bloated. Best of all it is a plant based soy protein powder. I currently use Gensoy protein powder as it is readily available at the local Walmart. I further supplement my protein intake by using soy milk to make my shake instead of water. I stopped using cow’s milk as I want to eliminate animal products from my diet and I am lactose intolerant. Add fiber to your shake to control your hunger and to prevent constipation. The fiber expands in your stomach and makes you feel full. This really helped me to reduce the amount of snaking I use to do. I have tried Psyllium fiber and Flax seed. Psyllium husk fiber is primarily a soluble fiber that absorbs about 50 times its weight in water. This helps create a bulkier, softer stool and minimizes constipation that is common during carbohydrate restriction. Flax seeds does pretty much that same thing that psyllium husk fiber does. However, psyllium husk fiber does not contain Omega-3 Fats. One teaspoon of ground flax seeds contains 1.8g ALA. The omega-3 fats found in flax seed can help protect your heart health. I currently use flax seeds as a source of fiber and I am very happy with it. • Mix and your good to go. Have one today! This awesome, and you know what? I’m getting back to the shakes!!! Its a good read! That’s great. Let me know how it goes.